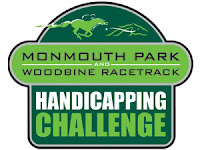 Outside of printing the past performances in advance, I will not be able to study tomorrow's Monmouth-Woodbine Challenge card much in light of a busy Saturday agenda, but the online contest slate is a busy one on this first Saturday of June. The organizers of Survival at the Shore are doing a wonderful job, in my view, of offering intriguing, deep-fielded races, and Saturday's is no different. Somehow, I have survived without sacrificing a lifeline and hope to continue that today, with Silent Bolt at 3-to-1 in a 12-horse maiden claimer in Race 2, 9-to-2 Silent Empress in Race 9 and 5-to-1 Nina Springs in Race 10. Unlike real-money contests, I typically do not go overboard on extreme long-shots this early in the contest, with 4,600 out of 6,500 players still alive. I am hoping to make it to June 30 without sacrificing a life preserver, and if I can certain take some shots at bigger prices. Right now, I'm in about 1,500th place with a modest $71.20 bankroll, about $90 behind the leader. 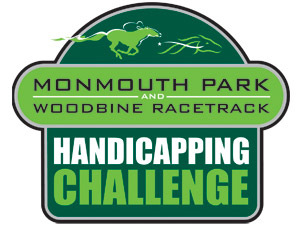 Public Handicapper has some interesting races as well, namely the Grade 2 Californian from Hollywood at a mile-and-an-eighth. Soul Candy looks compelling at 12-to-1, considering this hard-knocker has trained well off a 10-week layoff and I anticipate will be able to run into heady fractions set by Aggie Engineer, Gladding and 4-to-5 M/L favorite Twirling Candy. Prices galore in that field. Otherwise the 8-horse Aristides Stakes, a Grade 3 at 6 furlongs from Churchill, is also wide open, in my opinion, though I am going with Here Comes Ben at 4-to-1, as I anticipate the benefits of the rail position and second off a layoff; it looks to me like Ben needed the 7-furlong Grade 2 Churchill effort on May 7 after a 6-month layoff and will appreciate the cutback in distance.